Week two of holiday camps has been wonderful! Our theme for the week was ‘woodland warriors’ and we have used our natural resources to create the most beautiful artwork; engaged in using tools and role played being owls and other woodland creatures. We have provided the children with minimal art resources like glue, card and double-sided tape and have been absolutely amazed by the results! We have made forest postcards, masks, leaf presses and jewellery. All them completely unique and utterly gorgeous! The children have again, been so interested in using tools. This week we have used mallets to create ‘Hapa Zome’ artwork. This involves placing white fabric over various forest treasures (flowers, leaves, berries etc) before using the mallet to hammer down, which causes the colours to bleed into the fabric. Simple, but so effective! Some of you may remember that we have been avoiding our usual base camp over the last couple of weeks whilst waiting for some dangerous branches to be removed and completing a full risk assessment of the area. We were able to return here this week and the children have absolutely LOVED being back here. It was so interesting to watch them return to this environment; observe all of the changes and remember some of their favourite play spaces. In addition to all of these wonderful experiences we have, of course enjoyed our usual forest frolics and child initiated play. We've been on adventures; climbed trees; spotted rabbits; made caterpillar homes and two little girls even decided to paint each other's faces with mud! Taylor this week joins us in the forest. 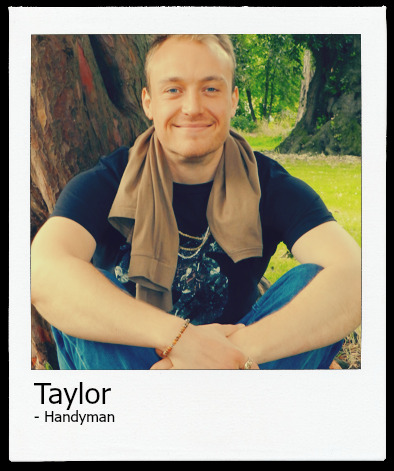 He will be taking over from Antonio as handyman and has already enthralled the children with his climbing and fairy game ideas. Also starting with us next week in the back office is Carly. Carly is joining us as Lisa's admin assistant as the volume of enquiries we are receiving these days are no longer manageable by Lisa! Carly will be helping Lisa with enquiries, answering the phones and other bits and bobs so be prepared to hear her happy voice if you call in to the back office. Starting next week we are going to start staff visiting between Chiswick and Wimbledon occasionally to allow the staff to enhance their knowledge by observing how other teams operate. Next week we have the pleasure of Manuel joining us in Wimbledon for the week. We have some very sad news for you. Jose, who has been with us since the beginning of LFF is leaving us at the end of August. He is moving back to Spain to undertake a year of study to achieve his diploma. He promises to return in June as soon as his studies are over...... We may even buy him some flights to make sure he comes back to us!! He is very sad to be leaving and it was a difficult decision for him so goodbyes may be a bit emotional. We plan to spend the next few weeks enjoying lots of special Jose fun before he flies! Next Thursday is our family BBQ. We are SO excited!! The children have this week made bunting to decorate the scout hall garden with and Becky has been coming up with delicious marinade suggestions. Please read our enrolled parents newsletter for full details. We would really appreciate everyone having a little look at home to see if they may have accidentally taken home another child’s property. In particular, we are on the lookout for sunhats! Newer PostChiswick - Pirate ships!